TSN Toronto reporter Mark Masters checks in daily with news and notes on the Maple Leafs, who practised at the MasterCard Centre on Tuesday. Frederik Andersen has a new outlook and a new mask this season. The ‘Blue Knight’ hopes to rise to the challenge this season in Toronto’s crease. He’ll play two of the Leafs’ final three preseason games, including on Wednesday in Montreal, and the workload will only increase from there. Andersen made 66 starts in each of the last two regular seasons, the second most in the NHL during that stretch behind only Edmonton’s Cam Talbot. Leafs head coach Mike Babcock won’t commit to getting his goalie more rest this season because, he says, it’s impossible to project if his team will need points down the stretch. 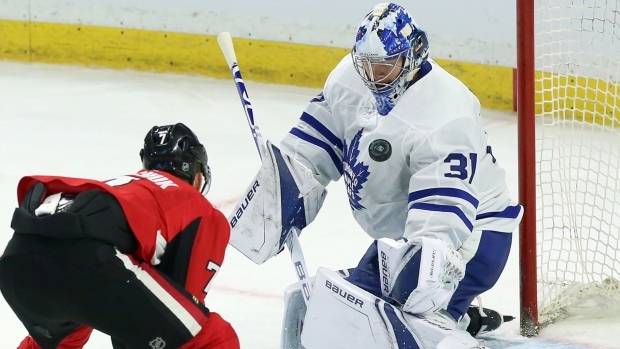 But, even if Toronto has to lean heavily on Andersen again, the 28-year-old believes he can handle it, in part due to a change to his off-season routine. Specifically, he did less weightlifting. The tweak to his summer workouts was made in conjunction with his California-based trainer Scot Prohaska. They worked on growing his core strength​. Babcock visited Andersen in his hometown of Herning during the summer. It was a big moment in the relationship between the goalie and coach and a chance for Babcock to lay out how he sees Andersen’s role evolving this season. The start to this season will be a key. The last two Octobers have been rough for Andersen, who posted sub .900 save percentages in the season’s opening month in both 2016 and 2017. “It’s just a matter of trying to be (at) game speed and (have that) intensity in practice and I think that will benefit me going forward to get that good start,” Andersen said. "I've been feeling really good actually, feeling more smooth on the ice, hopefully that’s something that will help benefit me in the beginning and even longer term." Andersen’s newest teammate John Tavares has been impressed with the early returns. Playing against Andersen in the past, Tavares always noted the goalie’s presence and size in the crease, but after practising against him daily during the last month he has gained a greater appreciation for the netminder. After icing an AHL-heavy lineup on Monday night, Babcock will have most of his top players dressed for the next two games in Montreal on Wednesday and at home to Detroit on Friday. “We'll get to see real players playing against real players," Babcock said. "The evaluation wasn't very good last night in all positions right from goalie, D and forwards. Didn't do a very good job, didn't look after the puck, got outplayed and you don't want that to happen too often so it's important we bounce back. "These contests that we have coming up will really help us. I know Detroit's bringing their 'A' group in here Friday night so that will be a good thing, too. So, we got two real good hockey games here this week that will be important in getting us where we need to go." Andersen will start the next two games while Curtis McElhinney will get the other start in Detroit on Saturday night. Garret Sparks, who struggled in Monday's loss, is trying to stay positive. "It's pre-season hockey," Sparks reminded reporters on Monday night. "I'm trying to get my game back. I'll show up at the rink tomorrow. I'll be the first one there and I'll get back to work." True to his word, Sparks was the first on the ice for his practice group and also among the last to leave. Zach Hyman missed another practice on Tuesday and hasn't skated with teammates since sustaining a hip-pointer injury on Friday against the Sabres. In his absence, Trevor Moore, who finished second in scoring for the Marlies in the Calder Cup playoffs last spring (17 points in 20 games), skated with Tavares and Mitch Marner. "I thought Moore was fantastic today," Babcock said. "I thought he was really good. Moorsey is one of those guys that if he gets out of his own way mentally he's a real, real good player and lots of skill and he's just got to be confident in his abilities. I thought that opportunity for him today was a real good one." Babcock, however, wouldn’t confirm if Moore would play against the Habs. Frederik Gauthier skated in a regular sweater for the first time since sustaining a shoulder injury. He took second reps as the fourth-line centre rotating in with Par Lindholm. It hasn't been a great camp for Kasperi Kapanen and Andreas Johnsson so far despite big expectations. After several false starts, Kapanen finally established himself as an NHL regular in the second half of last season and scored a big goal in Game 7 against the Boston Bruins. Johnsson also emerged late last season and played in Game 7 on a line with Nazem Kadri. He followed that up by being named MVP of the Calder Cup playoffs. And yet those two, skating between newcomer Lindholm, have yet to hit their stride. "I got a couple more steps, you know, I can be at," Kapanen admitted glumly after Monday night's loss. "We got three really good players on that line and I just feel like we're not at our full potential right now. But we still got a couple games left and a lot of practices." Even before Monday's game, Johnsson had been lamenting on his lacklustre camp in a conversation with TSN's Kristen Shilton. The task of finding chemistry is complicated a bit when you're playing with a centre who's new to the NHL and the North American game. "I had no idea what I was getting into," Lindholm admitted post-game on Monday. "It's a different style of game and I've never played that before. It's been fun and I keep moving forward and I'm excited for the next game." Babcock has praised the Swede, who played for Skelleftea in the SHL the last four seasons, throughout training camp and has been tutoring him quite a bit on the ice. "There's things he wants me to work on," Lindholm, 26, said. "I try to fix it. It's not easy to fix things right away, but I'm trying and keep trying and hopefully it will stick." Asked for an example of where Babcock wants him to improve, Lindholm revealed some of their conversations have dealt with defensive-zone positioning. Is Babcock staying in touch with restricted free agent William Nylander as the winger awaits a new contract? "I just shut it down totally," he said. "I just didn’t want him or his agent or anyone to be thinking I was trying to (impact negotiations),” Babcock said. “Willie knows we want him back. We’d like him back as soon as possible. That’s a business thing between them and (general manager) Kyle (Dubas). In saying that, it's way easier to be ready to go if you’re here." Auston Matthews, meanwhile, is keeping contact with his linemate to a minimum. "I kind of leave him alone," the Arizona native said. "I think he's obviously focused on making sure he’s in good shape so when that gets done that he can come here ... he’s a big part of this team. I’ve talked to him a little bit over the last couple weeks, but I don’t want to really keep peppering him and bothering him because he probably knows as much as you do."